Zircon is a beautiful natural gemstone with incredible fire and brilliance. The breathtaking colorless Zircon is an affordable alternative to diamonds. Zircon also occurs in blue, green, dark red, violet, yellow, brown, and orange. It is frequently used to celebrate December birthdays, the 4th wedding anniversary, and is a good gemstone for Virgos. Every jewelry wardrobe should have the most versatile and basic Rope Chain! A rope chain consists of oval links in a spiral effect so that they produce a woven rope-like look. This chain is one of the most loved of all the types of chains. Because of its strength, it is a popular choice for men as well as women. Optimistic and positive, gold adds richness and warmth to everything with which it is associated. It illuminates and enhances. Gold represents perfection in all things. This is 'earth friendly' as it is made with the Refined Karats system certified by Scientific Certification Systems' (SCS) strict environmental, social, and supply requirements. This is proudly made in America with a green process of ethically, environmentally and socially responsible production processes of water, waste and energy management; this is from 100 percent recycled Karats. The rising price of gemstone and gold makes this, quite simply, a great investment all around. Due to the natural state of the stones, each may differ slightly in color, size and inclusions. Gorgeous is Always Fashionable, Never Trendy... Thank You for Your Consideration, We Appreciate You! If you have any questions about this product by The Men's Jewelry Store (for KIDS), contact us by completing and submitting the form below. If you are looking for a specif part number, please include it with your message. 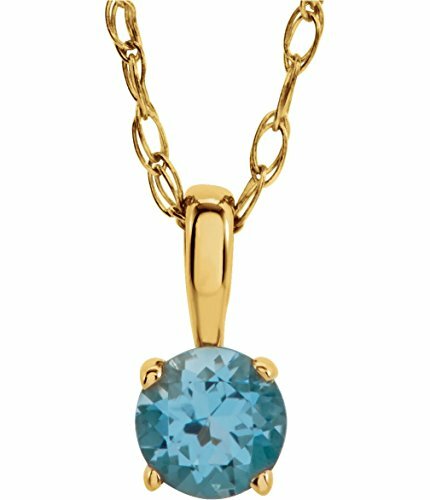 New 14k Yellow Gold 1.125" Solid Oval Miraculous Virgin Mary Polished Finish Pendant 1.5mm Rope Necklace, 20"
14k Gold Small Star of David Children's Necklace 15"